My kids are crazy about mangos. When I made Mango-Peach Smoothies recently, I marveled at the thick, velvety texture the mango created. With their wonderful texture and incredible sweetness, I started thinking mangos would make a great muffin. Yet, we seldom (never?) 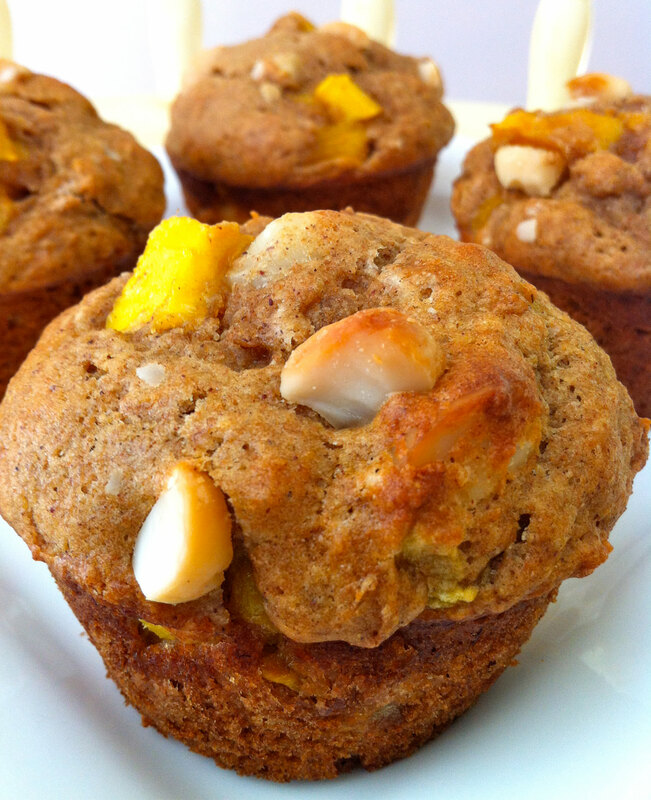 see mango muffins! I was also thinking that pureed mango could be incorporated the way applesauce is often used to reduce the amount of oil in baked goods. Figuring most people wouldn’t want the extra step, I stuck with chopping the mango and decided to keep the added sugar to a minimum, hoping the natural sweetness of the mango would do the job. After using coconut oil in lieu of butter or canola oil, I thought the addition of macadamia nuts would create a nice, tropical spin. The end result was a 5-star rating from the gang–a definite “make-again muffin”, they said! In a large bowl, combine flours, sugar, baking soda and powder, cinnamon, and salt. In another bowl, combine the eggs, oil, applesauce, and lime juice. Stir in the mango, mashed bananas, and nuts. Create a well in the center of the dry ingredients and pour the wet ingredients into the dry ingredients. Stir until just combined. Scoop into twelve well-greased muffin tins (I like to use an ice cream scooper) and bake at 350 degrees for about 20 minutes or until the muffins pass the toothpick test. Mine took exactly 20 minutes. Cool in the pan for 5 minutes, then remove to a rack and cook completely. Mmm these look great! How many does the recipe yield though? The recipe yields twelve good-size muffins. I like them big enough to fill me up if I eat one for breakfast, without going the way of the jumbo muffin. I hope you like them as much as we do!